Glen and Teena Patterson have 24 years experience in the Pet Industry, specifically Aquatics, with 20 of those Designing and Manufacturing Aquarium Cabinetry while utilizing his degree in Architectural designs. 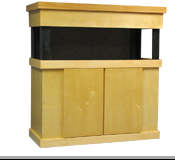 ABOUT AQUARIUM WOOD PRODUCTS, INC.
AWP started in the Tampa Bay Florida area supplying local retailers and small distributors. Soon AWP was supplying retail stores and distributors throughout the United States. 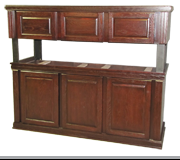 AQUARIUM CABINETS, AQUARIUM CANOPIES, AQUARIUM FURNITURE, FISH TANK STANDS, AQUATIC STANDS AND CABINETS AND TOPS. All of our color stains are blended specifically for AQUARIUM WOOD PRODUCTS, INC. Our strict guidelines give you the brilliant colors to match any of the furniture on the market and if we do not carry the color you need, we have the ability to blend the stains to match your specific needs. Our AQUARIUM CABINETS AND CANOPIES are designed with the user in mind whether it is servicing a filter in the Cabinet or maintaining a coral in the Aquarium. WE FIT ALL THE NEEDS. Many have TRIED TO DUPLICATE our Cabinetry, but they have NEVER fully succeeded because they DO NOT HAVE the passion and years of experience that we have to offer. By not trying to serve the Big Box Chains and mass marketers, we are ABLE to keep hands on to offer the QUALITY AND CRAFTSMANSHIP it takes to be the BEST. Feel free to come by and visit our facility at 3692 S. Byron Butler Parkway, Perry, FL if you are in the area. We will be glad to give you a firsthand look at how some of the best aquarium products in he southeast are designed, manufactured and shipped.